Under the table Winston’s feet made convulsive movements. He had not stirred from his seat, but in his mind he was running, swiftly running, he was with the crowds outside, cheering himself deaf. He looked up again at the portrait of Big Brother. The colossus that bestrode the world! The rock against which the hordes of Asia dashed themselves in vain! He thought how ten minutes ago — yes, only ten minutes — there had still been equivocation in his heart as he wondered whether the news from the front would be of victory or defeat. Ah, it was more than a Eurasian army that had perished! Much had changed in him since that first day in the Ministry of Love, but the final, indispensable, healing change had never happened, until this moment.The voice from the telescreen was still pouring forth its tale of prisoners and booty and slaughter, but the shouting outside had died down a little. The waiters were turning back to their work. One of them approached with the gin bottle. Winston, sitting in a blissful dream, paid no attention as his glass was filled up. He was not running or cheering any longer. He was back in the Ministry of Love, with everything forgiven, his soul white as snow. He was in the public dock, confessing everything, implicating everybody. He was walking down the white-tiled corridor, with the feeling of walking in sunlight, and an armed guard at his back. The longhoped-for bullet was entering his brain. Popular culture reinforces the principle of finding salvation by “snitching” or “whistle blowing” on your fellow citizens. stars Dwayne Johnson, otherwise known as professional wrestler The Rock. His character in the based-on-a-true-story film aims to deliver drug dealers to authorities in exchange for reduced prison time for his son. The son was unwilling to rat on a buddy to cut a deal. The character played by Dwayne Johnson is of course a hero! But, reality imitates fiction (or is it the other way around?). the problem for him, as someone with no previous drug arrests, was finding drug dealers to inform on. “You start running the streets. You go to the places where drug dealers go, trying to find drugs. “I had gotten to the point at the end, I was desperate, I didn’t care who went to jail. I would have taken anybody down, just so I could be with my family,” says Horner. “We’ve created thousands of little criminal entrepreneurs running around looking for other people to snitch on,” she says. Horner failed to make cases against drug traffickers. As a result, he was sentenced to the full 25 years in October last year and is now serving his sentence in Liberty Correctional Institution, outside Tallahassee. He will be 72 by the time he is released. I recommend reading this article and listening to the podcast. You will see how and why the creation and manufacturing of crime pays. You will see how “whistle blowing creates incentives to invent crime”. This is all in the context of the “great American war” on drugs. But that is not the only “great American war”. It’s like this: you are a Russion oligarch who stole hundreds of millions while your country was dismantled. Moved it to Cyprus, paid not tax on interest earned over years and now will lose 40% of your ill-equired money. Big deal. If you have say 100M you’ll be still left with 60M tax free and secret. Not a bad deal at all. If this helps them to pull out of crisis, I am glad for them. After this UN must go after tax havens and recover those TRILLIONS stolen and hidden in them. Bet few of our own are amongst them. By the way, will you report that friend of yours who hides 100M in Bermuda? I wish I knew him. He’d be done in no time. Remember whistleblowing is the right thing to do even if against your own. No one has the right to hurt countries and people and get away with it. In our so called free market it seems to be acceptable by many. Not by this writer. Yes, U.S. tax evaders have a bounty on their heads. The IRS whistleblower program will pay up to 30% of all assets seized from tax evaders. Now think about all of the people who can supply the IRS with all of your offshore information; many in low paying jobs. You very well may be someone’s retirement plan. Whistle Blowers and Morality – Should anybody/fiduciaries be allowed to be “whistle blowers”? What about the great American war on offshore tax evasion? We know that the IRS promotes the “Whistle Blower” program. Bradley Birkenfeld was the first great “entrepreneur”, to take advantage of this opportunity created by the government! He sought riches and salvation by turning in his fellow citizens. What is interesting about Bradley Birkenfeld was that as a banker, he may have been in a fiduciary relationship with the very clients he turned in. Lawyers also stand in a fiduciary relationship to their clients. Furthermore communication between a lawyer and a client are subject to the laws of privilege. Therefore a lawyer should not (one would think) be allowed to “turn a client in”. On the other hand, lawyers apparently have no difficulty turning other people in and have created law firms to assist people in collecting “whistle blower” awards (of course taking a percentage for their fee). Whistle Blowers and Morality – Should the government be in the business of turning citizens against each other, of intruding into the family relationship? 2. Receiving a monetary reward from the government for your discovery. To report crime is arguably an act of “good citizenship”. To actively seek out crime and receive monetary compensation for it, is to turn crime into a business. There is a difference. A healthy functional society is dependent on nurturing the values of solidarity, friendship and mutual trust. How can communities, businesses and even governments function if nobody can trust anybody? Shouldn’t you (at the very least) be able to presume that lawyers and other fiduciaries (certain kinds of bankers) cannot “turn you in”? It is worth noting that North American (or at least U.S.) society has evolved to a point where there is no longer a distinction between law and morality. In other words, everybody is guilty of some crime. Everybody is a criminal. Can support for “whistle blowers” be justified in this context? 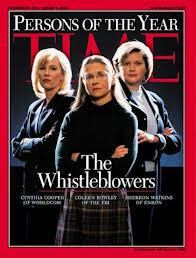 Justifiable or not, the concept of “whistle blowers” is marketable. In fact, Cornell law school has recently introduced a course on whistle blowers. They would argue that they are just obeying the law (the fact that it is a U.S. law seems to be irrelevant). The Canadian banks don’t appear to see any moral implications in identifying U.S. account holders and turning that information over to the IRS. Canadian financial institutions seem to be actively collaborating with the IRS. I presume that a bank employee would be well positioned to become an “IRS Whistle Blower”. Why not? After all the law allows it! The banks are encouraging it! denounce their fellow citizens suspected of U.S. tax non-compliance? Well it depends on your view of morality. There are those who believe that laws should be a function of moral values which stand apart from the law. Then, there is an increasingly large number of people, who believe that law and morality are one and the same. It’s worth noting that the United States has so many laws and regulations that every U.S. person is in violation of some law all of the time. What about all those U.S. citizens living in Canada who own Canadian mutual funds (PFICs)as part of their “retirement plan”? Perhaps YOUR retirement plan can become someone else’s retirement plan!